4. Is anyone home during the day? 7. Are you prepared to potty train (I will provide instruction)? 8. Do you have children? What are their ages? I am not opposed to selling to family's with children. Remember that I have 10 grandkids! one before I would like that vet's name and phone number please. 11. We want you to come to visit us and pick up your puppy. Is this acceptable to you? contact them for a reference. 14. How long have you lived at this address? 15. Will you be attending any training classes? 16. How long did your last pet live? 17. Have you ever returned a dog, and if so why? 18. Have you ever given a dog away or taken a dog to a shelter, and if so why? 19. 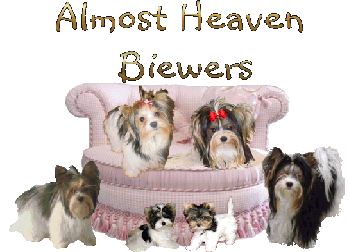 What are your expectations for a Almost Heaven Biewer or Cloverdale Yorkie pup or adult? 21 Do you already own a Biewer or Yorkshire Terrier? registration papers are held by us. Germany (Europe)? If so which one? 24. Do you have intentions to eventually breed the puppy/dog? 25. Are you interested in showing the puppy/dog? 26. Have you ever shown a puppy/dog before? unscrupulous breeder? If you need to place the pup/dog we will assist you. 28. Please tell us a little bit about yourselves! the way that we take care of ours, with love, affection and true devotion! 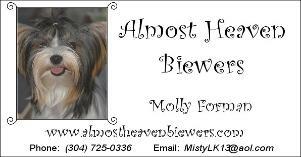 Please copy and paste this into an email or a Word Document and address it to MistyLK13@aol.com. up with a phone call... sometimes email goes into my SPAM folder and I don't see it! IMPORTANT NOTE... 6% West Virginia sales tax will be added to all pups sold. so as my time allows! great deal of human contact! wormed and vaccinated appropriate for his or her age. training your new pup, or arrange to have the dog trained. intended to provoke you into thinking about how you will handle certain issues related to your pup. Others are to aid in your pup's selection from the litter. I retain all registration papers that are sold on a pet quality puppies. had their first set of vaccinations, typically at 8 weeks of age per Veterinary recommendation. We very much appreciate you're taking the time to read this and fill out this application. Of course I will be very select in whom I sell my pups too. My pups will be sold as pets only. Co-Ownership with anyone other that myself will have to be under written contract and signed by me. As you can imagine, this is MOST IMPORTANT to me!!! !